Notes: Made but a pair of brothers in a family steel business , Andris and Eric Lagsdin who got the idea from the Modernist Cuisine movement. This pizza steel is designed to replace those fragile pizza stones that we all buy, love, and break in about that order. Directions and Instructions: Very straightforward. The steel is already seasoned and ready to go when you get it. Just read the (minimally necessary) directions and shove it in your oven to let it preheat and away you go ! Testing: We first of course tried it with a pizza… Steel was put into cold oven and oven turned up to 500 degrees (fahrenheit) .We tossed some corn meal (natures ball bearings) on the steel just prior to slipping the pizza on Pizza was slipped onto steel via a paddle. About 15 minutes later pizza came out easily with paddle with AMAZING crust .As close to perfect as I have ever gotten. We later tried it with stromboli and various breads, all came out much better than with a sheet or stone. Always great results and easy clean up every time while steel started to patina with use. We also used it as a griddle on both the indoor gas stove and our outdoor grill – it is the bomb ! Other: The Baking Steel being a 15-pound, ¼-inch-thick piece of steel is a great way to keep an even temperature in your oven ( especially to mitigate opening the oven door to check something and have the temperature drop). So it helps stabilize the temperature even if you are not using it directly . I just leave mine in th oven all the time on a bottom shelf for storage with the added benefit of the heat mass. This has the added benefit of being able to find it easily and also I don’t have to worry about wrestling it from some storage and into the oven when I need it – it’s always there and ready to go. There is also a ½ inch version with twice the weight and heat mass – haven’t reviewed it yet but it might even be more awesome than this beast.Ther is also a cary case available so you can carry this beast around in a more hygienic and handier manner if you want to take it around to other peoples places. 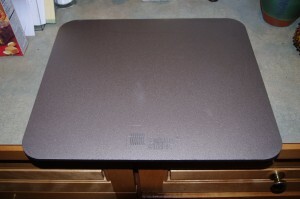 Final Thoughts: If you are serious about your pizza and/or all the many other things you can cook or bake on a pizza stone or steel this is a must have. Between its stellar performance, durability, ease of use, and cleaning it doesn’t get much better than this. Yes, pizza stones are cheaper but they can (and do) break , this is something that will not only never break put you can pass down to your descendants . Nicely done website, well laid out, easy to navigate, good photos and descriptions of all products.If everyone had a website as well done as this the web would be an easier place to shop!